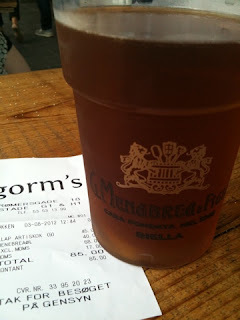 A recent business trip meant an opportunity to sample some of Copenhagen's delights. I arrived around lunchtime, and was thrilled to see that there was a lovely food market - Torvehallerne - right by our hotel. First stop was Gorm's for a 'pizza sandwich' and as they had a beer on draught which I'd never heard of I gave the dark Menabrea a try. 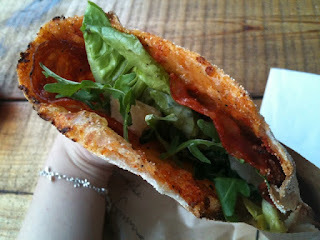 The sandwich was delicious - half a salami and artichoke topped pizza, folded in half and filled with salad. The salad was fresh and crispy, with a delicious light caesar-style dressing and the pizza had been freshly baked, had a perfectly thin and crispy base and topped with a delicious moist salami. The beer was nice enough, but nothing to write home about. We spent the rest of the afternoon having a wander and doing some sightseeing, before a lovely (and very filling) supper at Tight. I started with a beef carpaccio, which was tasty but marred slightly by the over-use of truffle oil drizzled over the top. Sam started with a delicious cured salmon/Gravlax, served with a toasty rye bread and dill cream, which I wish I had chosen too. To follow I went for the Tight Burger, which is highly rated in the Danish burger scene. It was a mammoth dish, a huge burger served in a focaccia bun, topped with onions, mushrooms, slaw, cheese and bacon. The focaccia was surprisingly light, and very tasty. As a whole burger it was delicious (albeit impossible to eat - I had to go for the knife and fork option), but I would say that the meat on its own was not especially tasty - I was expecting a much beefier patty. Again I was jealous of Sam's choice - pork medallions with a honey and mustard crust. And again, the portions were huge. The meat was delicious, with a lovely balance between the flavour of the crust and some really juicy pork loin. We were pretty tired/full by this point, but it was still relatively early and we knew that Nørrebro Bryghus wasn't too far from the hotel and had come recommended, so we stopped by for a nightcap (and also ended up watching a rather frantic game of handball﻿﻿ - Norway v Denmark, sadly (given our location) Norway won). We tasted the Stuykman Wit, a deliciously strong and funky tasting unfiltered wheat beer, the New York Lager, which was full of flavour and was full of hops, and the Pacific Summer Ale, a guest brew created with beer god Garrett Oliver which again was big on flavour and heavy with American hops. We were very impressed with the beer and promised ourselves a return visit to sample more on a day when we were slightly less tired. The ﻿following day involved a tasty brunch at Paludan, a lovely little cafe inside a bookshop. Brunch included yoghurt and muesli, fruit, bread, ham and cheese. Oils, vinegars and spirits. We picked up a small bottle of citrus Vin Cotto. ﻿﻿We then picked up some supplies from the market (pictured above) and took a trip out to Frederiksberg, and had a lovely relaxing day in the sunshine, including a visit to one of the most bizarre art galleries we've ever been to; inside an underground sewer. Dinner that evening at Frederiks Have was so good it warranted a post of its own. Sunday brunch from Kalaset set us up for a visit to the Danish Design Centre which was fascinating and worth every penny of the entrance fee, followed by the obligatory trip to Tivoli Gardens. For lunch we had some amazing (and huge) hotdogs topped with crispy onions, mustard and pickles from the famous Anderson Bakery located on one side of Tivoli, which I washed down with possibly the most pointless beer I've ever tasted - Carlsberg Copenhagen - which (and I quote directly from their website) "has a light, refreshing taste, while the design is rooted in Copenhagen as an international city of fashion and design. Copenhagen is intended for modern women and men, who appreciate a refreshing taste delivered in a stylish design." I can confirm that yes, I quite like the bottle - I'm a sucker for a clean design - but the beer tastes a lot like fizzy water, only less pleasant. Never again will I be suckered in by a nice label. Or at least not til next time. We were surprised and quite pleased to find out that Tivoli housed a small brewery, Faergekroen Bryghus, so we obviously had to give it a try. A blond and an amber beer were the only two available, so we tried one of each. The beer was nice enough, but relatively bland, which I'm guessing they'd have to be to compete with the mainstay of Carlsberg lager which is to be found pretty much everywhere else in Copenhagen. A good cue for us to head over to the nearby Mikkeller bar. Vesterbro Pils (Mikkeller) - Sam thought this is probably same as the Craft lager, very drinkable. Mexas Ranger (Mikkeller) - a spiced beer, like a light imperial stout, a bit bland at first, but grew in flavour, slight brettanomyces characteristics. Wag 'n' Wisdom (Evil Twin) - A really funky wheaty flavour which Sam found too bitter. Koppi IPA (Mikkeller) - bought by mistake as Sam didn't realise 'Koppi' meant 'coffee', nice enough but the coffee is dominating everything. Ubertart (Evil Twin) - Delicious! Bright red in colour, flavoured with cherries, fresh tasting with slight woody notes. Who's Drinking Gilbert Grape (Evil Twin) - Slightly sour and very funky on the nose, tastes sweet and grapey, belies its high alcohol content (9%). Dino (Mikkeller) - A dry fruity saison, another funky one with weird yeasty notes. Beer Geek Breakfast (Mikkeller) - Deliciously smooth oatmeal stout, rich, dark and beautiful. Gueze 2011 (Cantillon) - I couldn't resist as you hardly ever see this on tap. And I'm not embarrassed to say it was my personal favourite of the night. We also got to try something completely new to us through fortuitous chatting to an American couple on the table next to us who had brought some beer over with them from Washington DC - DC Brau is a microbrewery which has only been operating for just over a year. The Penn Quarter Porter we tried was a deliciously fruity porter, with cherry and coffee notes coming through. General consensus was that the beer was slightly infected, but it was still very tasty. Big thanks to Andy and Deirdre for letting us join them to try it! For our final day we started with coffee and fresh pastries at the market. Then moved on to a little sightseeing and a great lunch and a couple of beers at Nørrebro.